Oakland Athletics outfielder Rickey Henderson was playing on the edge when he stepped up in his third at-bat against the New York Yankees on May 1, 1991. It might be more appropriate to say he was playing a live-action version of third time’s the charm. Three days earlier, Henderson had tied Lou Brock’s Major League Baseball record for stolen bases. On the cusp of taking sole possession of the record, Henderson stepped into the batter’s box in the fourth inning having failed to overtake Brock in his two prior at-bats. He reached first base in the first inning but was thrown out trying to steal. The following inning, Henderson was called for his third strike. Then came the fourth inning. Henderson once again reached first base thanks to an error on a ground ball. Dave Henderson then singled on a ground ball toward third base, and Henderson advanced to second. The next batter popped up to center field, and Harold Baines stepped into the box to face New York’s Tim Leary. The count was one ball, no strikes when Leary threw a changeup into the dirt. Henderson began to haul tail and dived headfirst into third base — and the history books. He had made it to third without third baseman Randy Velarde even trying to tag him. Henderson stood up, body erect, arms lifted to the sky in triumph. With 939 stolen bases, he was baseball’s career leader. That night, Henderson celebrated by cracking open a bottle of champagne he’d held on to since graduating from high school 25 years earlier. 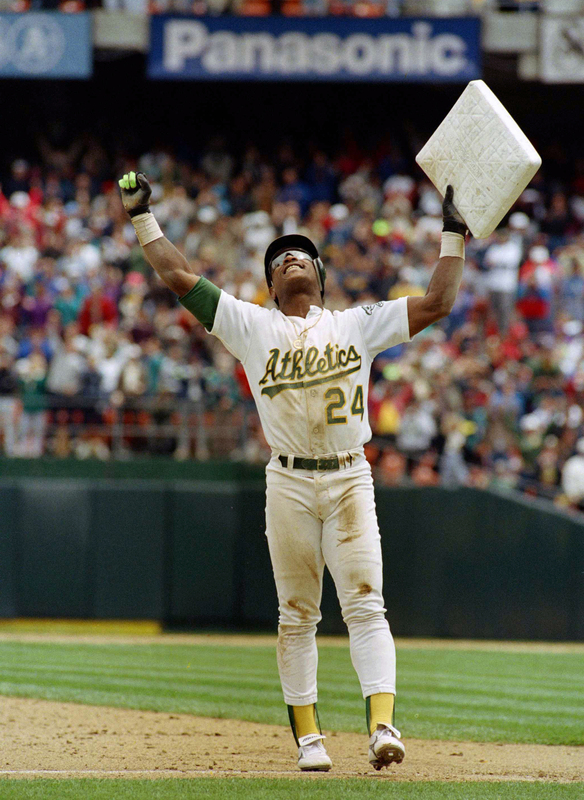 In this May 1, 1991, file photo, Oakland Athletics’ Rickey Henderson celebrates and raises third base after setting the all-time stolen base record during the Athletics’ baseball game in Oakland, California, against the New York Yankees. The stolen base was Henderson’s 939th, moving him past Lou Brock. Henderson took third base from its mooring and lifted it into the air as the crowd of 36,139 at the Oakland Coliseum cheered him on. Bobbie Henderson, Rickey’s mother, came down to congratulate her son. There was an eight-minute delay in the game as Brock was walked onto the field to congratulate Henderson. It took 13 seasons for Henderson to break the record — well, 12 seasons and 19 games into the 13th year. “Today, you are the greatest competitor that ever ran the bases in the big leagues,” Brock said. The A’s gave the left fielder a sports car and announced a $75,000 charitable donation in Henderson’s name. Henderson thanked the organization, the city and his former managers Tom Trebelhorn and Billy Martin. Trebelhorn, the Milwaukee Brewers’ manager at the time, was Henderson’s first manager in the minors.